Chicago Transformer Co. transformer. Hermetically sealed. Rounded corners. New, shelf worn. Primary 210, 220, 230, or 240 volt AC 50/60 Hz to secondary 7.5 volt center tapped at 24 amp. 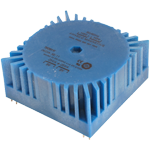 Dimensions: 4-1/2" x 5" x 6-1/2"
Electro Vector transformer. Hermetically sealed. New, shelf worn. Primary 225 volt AC to secondary 9.2 volt center tapped at 45 amps. 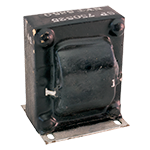 Dimensions: 4-1/2" x 5" x 8-1/2"
UTC transformer. 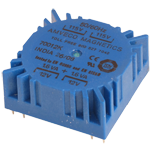 4000v Hi-Pot. New in the factory box. NSN: 5950-01-140-8903. 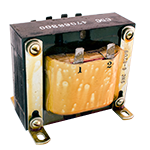 Primary 105, 115, 210, 220, or 230 volt AC 50-60 Hz to Dual secondaries 10, 11, or 14 volt at 10 amps each. Dimensions: 5"D x 5-1/2"H, 5-1/2" x 5-1/2" base. Mount holes 4"OC. 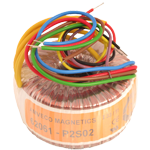 Scientific Radio filament transformer for two 3-500Z triode filaments in series. Works on 4-400A as well. Primary 105, 115, 125, 210, 230, or 250 volts AC to secondary 10 volt center tapped at 15 amps and 24 volts center tapped at 1 amp. 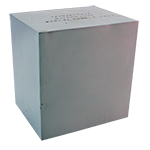 Dimensions: 4-1/2"L x 3-1/2"W x 3-3/4"H Weight: 8 lbs. 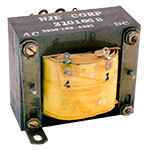 General Electric dry type transformer. Buck-boost. 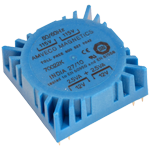 Primary 120 or 240 volt AC 60 Hz to secondary 16 or 32 volt. Rated 500VA. 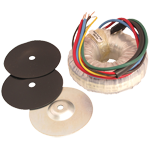 Two 117v 50/60Hz International Primaries; Two secondaries 9v, 1.67amp, 30VA. 3"DIA x 1.5"H 1.1lbs. UL & CSA recognized/certified. 10" Color coded leads. Class A 105°C. Primaries must be connected in series or parallel. 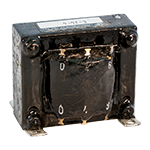 Two 117v 50/60Hz International Primaries; Two secondaries 9v, 5.3amp, 95VA. 3.9"DIA x 1.5"H 2.2lbs. UL & CSA recognized/certified. 10" Color coded leads. Class A 105°C. Primaries must be connected in series or parallel. 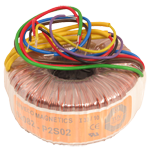 Dimensions: 2" x 1-3/4" x 1-5/8"
Magnetek power transformer. Primary 115 volt to secondary 10 volt center tapped at 0.25 amps, and 5 volt at 0.5 amps. 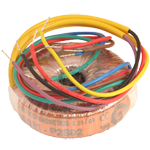 Dimensions: 34.9mm L x 28.5mm W x 30.15mm H.
Filament transformer. Primary 117 volt to secondary 12.6 volt at 1 amp. 50/60 Hz. Made in Japan, circa 1970. 2-1/8" mounting centers. Dimensions: 3" x 1-1/2" x 1-7/8" high. 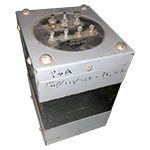 Gramer-Halldorson power transformer. 1.75" c-c mounting holes. 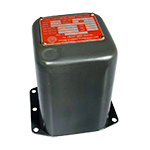 Dimensions: 3-3/8" x 3" x 2-7/8"
NJE Corporation power transformer. Primary: 115 vac (1-4), Secondary: 13v @ 1a (5-6), 8.5v @ 6a (7-8/9). 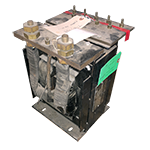 SNC Dual Power Transformer. Dual 8v @ 3a. Open frame. 2-1/4" x 3-1/8" mounting centers. Mutron Corp. transformer. Hermetically sealed. 5-1/16" x 4-1/16" x 5-1/4". NYT open frame transformer. Epoxy coated. Primary: 1,2: 120v. Secondary #1: 9.5v @ 1 amp; Secondary #2: 9v @ 1 amp. 2-1/4" x 2" x 2-3/4". 1-1/2 lbs. Signal transformer. Dual 8v c.t. @ 4 amps. Series: 16v c.t. @ 4 amps. Parallel: 8v c.t. @ 8 amps. Chicago Transformer filament transformer. 50/60 Hz. 32vA, 2500v test. Made for Collins. 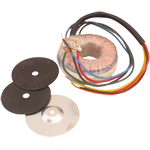 Continental Electronics filament transformer. 222vA, 2kv RMS. Thermador. Used. Continental Electronics filament transformer. Used. Spare for Continental 420.